NEW YORK, Dec. 20, 2018 /3BL Media/ – CIT Group Inc. today announced it will donate one and a half million meals this holiday season in partnership with Feeding America®, exceeding the original goal of its One Million Meals campaign by 50 percent. To participate, individuals could follow the #GiveLikeYou hashtag on Twitter and Facebook and vote for one of three Feeding America® Programs. CIT also contributed meals for every opening of a Savings Builder account at CIT Bank, the company’s national online bank. Among the three programs, the Senior Grocery Program obtained the most votes from participants and will receive half of the meal donations. The Mobile Pantry and BackPack Programs will each receive approximately one quarter of the remaining meals. 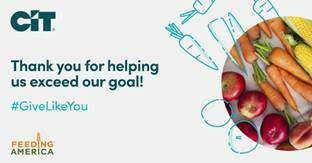 Feeding America® is a nationwide network of 200 local food banks and 60,000 food pantries and meal programs that together serve more than 46 million people each year. CIT’s campaign kicked-off on Giving Tuesday, Nov. 27, and ran until Dec. 20. CIT is a leading national bank focused on empowering businesses and personal savers with the financial agility to navigate their goals. CIT Group Inc. (NYSE: CIT) is a financial holding company with over a century of experience, approximately $50 billion in assets as of Sept. 30, 2018, and operates a principal bank subsidiary, CIT Bank, N.A. (Member FDIC, Equal Housing Lender). The company’s commercial banking segment includes commercial financing, real estate financing, equipment financing, factoring and railcar financing. CIT’s consumer banking segment includes its national online bank, CIT Bank, and a Southern California branch bank, OneWest Bank. Discover more at cit.com/about.